Here’s another wow-oh-my-god-I-looove this recipe. I made it last Saturday afternoon. We noshed on it while watching Cliff Lee (Phillies pitcher) hit a home run. Yes, I said pitcher, and yes, he hit the ball, and yes, it was a freaking home run! What a moment! Despite myself, I’m becoming quite a baseball fan. Who would’ve thunk it? 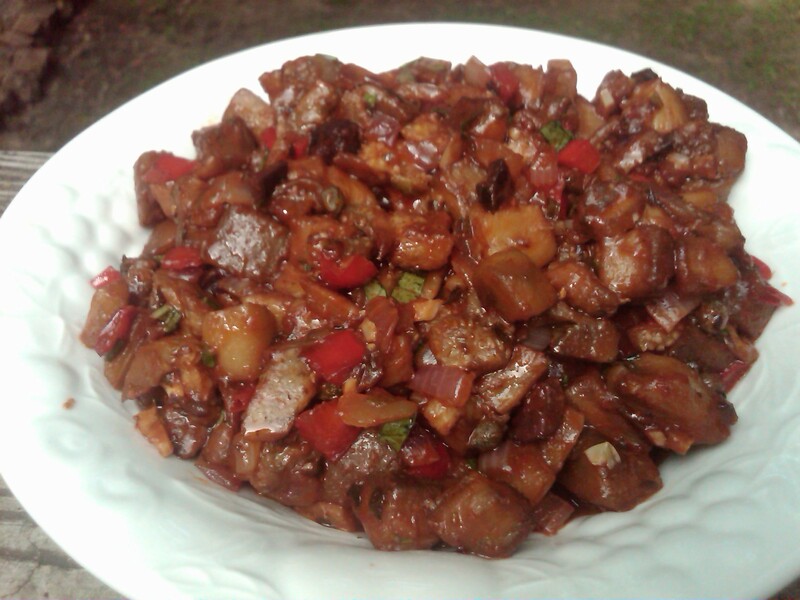 I’ve had caponata on my weekend snack list for a while. In the early evening Friday while doing a little beer and wine shopping at my Lowes Foods, I checked out their discount produce rack. I love the treasure hunt aspect of this rack. Sometimes it contains really scary looking stuff or it’s bare, but occasionally I hit the jackpot. Once again the produce buyer must have gone wild with the red bell peppers because they had a cart full of them – packages of three for $1.59. Score! I also spied a package of assorted skinny eggplants for less than a buck. At last, caponata! I’ve only had caponata a few times but really love it. A restaurant in the DC area served it alongside homemade breadsticks to every table. Maybe Paolo’s? It has a strangely sweet yet hearty flavor. I could easily eat a bowl for dinner. Next time I’m going to chop the vegetable even more finely so the caponata spreads more easily. I added red bell pepper to the recipe because I had so many in house and I thought they would add nice color and flavor to the recipe. And I added garlic because, well, just because. I also added fresh oregano because my oregano plant is growing ten times faster than I can use it. You could also add more olives (green or black). Caponatas I’ve had in the past were heavier on the olives than this recipe. I thought the rest of the original recipe’s ingredient ratios worked well. Give this a try. It’s a healthy alternative to a creamy dip and just think of all the vitamins you’re getting. Pour a glass of sangria, grab a baguette and start chopping! In a large skillet, heat the oil. Add the eggplant, oregano and salt and cook over medium-high heat, stirring occasionally, until tender, about 5 minutes. Transfer the eggplant to a bowl. Add the onion, red bell pepper and more oil, if needed, to the skillet and cook over medium-low heat until the vegetables are tender, about 6 minutes. Add the garlic and saute until just beginning to golden. Return the eggplant to the skillet. Stir in the capers, olives and balsamic vinegar and cook until the vinegar has evaporated. Add the tomato sauce and cook over low heat, stirring, until thickened, about 2 minutes. Stir in the basil. Season with salt and pepper and transfer to a bowl to cool. We ate it lukewarm because we couldn’t wait. It’s also fine just out of the refrigerator. Serve the caponata on slices of baguette. It can be refrigerated for up to three days.